Using high temperatures, elevated pressure and oxygen, POX will recover more gold. 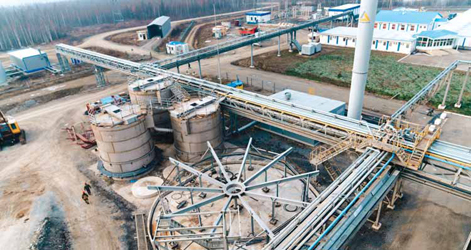 Polymetal International has started construction of a second pressure oxidation (POX) line to process refractory gold concentrates at its Amursk facilities in Russia’s far southeast. Designated POX-2, the project site is immediately adjacent to the current Amursk POX plant within the city of Amursk and will share some of the external infrastructure (gas main, access road, water main) with the existing POX facility. Additional electricity supply will be provided via a new dedicated power line from the regional grid. POX-2 is designed to process double- refractory concentrates, which contain micron-sized gold particles encapsulated in sulphides (pyrites and arsenic pyrites) together with high concentrations of organic carbon. High carbon content drives high-sorption activity (preg-robbing) and dictates the use of high-temperature (240°C) pressure oxidation compared to the medium-temperature (200°C) oxidation utilized at the existing Amursk POX facility. Pressure oxidation was selected as the most feasible processing technology for double-refractory ores. It is able to achieve gold recoveries of 96% by utilizing high temperatures, elevated pressure, and oxygen to recover encapsulated gold, while conventional cyanidation methods would result in sub-optimal recovery rates of 20%-40%. Completed metallurgical tests on high-carbon concentrates from Polymetal’s Kyzyl and Mayskoye mines have confirmed a recovery rate of 96%. Throughput capacity at the POX-2 plant will be 250,000 metric tons per year (mt/y) to 300,000 mt/y of concentrates. The design of the facility will enable processing of feed with different properties without impacting any of the design parameters. The plant also will have some capacity to treat third-party refractory concentrates, a market that has grown considerably in Russia and globally in recent years. Pre-production capital expenditures for POX-2 are estimated at $431 million and will be entirely funded out of Polymetal’s operating cash flows. Hatch Inc., Toronto, Canada, is responsible for the basic engineering, detailed engineering, POX procurement support, and the supply of custom-made equipment for high-pressure and acidic processing areas. Polymetal Engineering is responsible for other processing areas, general site layout and infrastructure. Processing concentrates from Polymetal’s mines at Kyzyl, Nezhda, Mayskoye, and Voro, POX-2 is expected to generate significant economic benefits, as all of its refractory concentrates will be retained for in-house processing as opposed to selling to third-party off-takers. POX-2 gold production will average about 500,000 oz/y. An estimated total of 4.3 million mt of concentrate containing 9.3 million oz of gold will be processed over a period of 23 years.